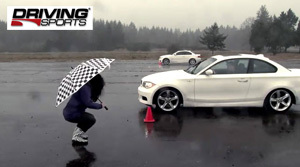 The Driving Sports team comes together to test how a modified 2009 BMW 135i stacks up against a brand new 2011 model. Can the N55 twin-scroll single turbo outperform a N54 twin turbo? The BMW 1-Series began its life back in 2004 when the 3-Series was moving up in the world and BMW needed another small family car to serve as an entry model. It started off as a 5-door hatchback, but was introduced as a 2-door coupe, a 3-door hatchback, and a convertible in 2007. The current engine selection consists of a 3.0L I-6 producing 230hp and 200 lb-ft of torque, and a 3.0L twin turbo I-6 producing 300hp and 300 lb-ft of torque. Both engines are mated to either a six-speed manual or a six-speed automatic transmission.